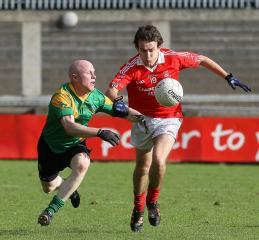 On a wet and heavy pitch in Glenalbyn last Saturday, lady luck shone down on St. Brigids in their AFL4 league match. Playing into a stiff breeze in the first half the Russell Park men worked the ball up the pitch very well to their inside forwards. Conor Brennan showed well early on, scoring 2 points from play, with a further point from a free off the boot of Paul Whitty and a well worked team point finished off by Brian 'Mini' McIntyre, who subsequently had to be taken off injured, after putting in a great performance in the first 20 minutes, brought St Brigids into half-time on level terms (0-4 each). However, the same desire and work rate was missing in the second half, with Kilmacud Crokes getting on top and using their possession to great advantage. A brilliantly taken goal, accompanied by 4 unanswered points gave the Stillorgan men an unassailable lead with only 7 minutes remaining, or so you would think. Needing to do something, mananer Dan Twomey introduced 3 further subs in the last 10 minutes, with one of them, Eoin O' Brien, kicking St. Brigids' first point in the second half from a free with 53 minutes of the game gone. A second point on 55 minutes brought Brigids to within 5 points. It was the never say die attitude, coupled with Crokes complacency that saw the impossible become a reality. Cometh the hour cometh the man, with 3 minutes remaining Colm Laffan, after moving to midfield, found himself on the end of a well worked attack to fire the ball to the Kilmacud net. He wasn't finished there, and with only seconds left in the game Laffan found himself in the box again letting fly. Following 2 deflections the ball skidded to the net, putting St. Brigids one point ahead. The referee blew the final whistle,within seconds of the kick-out and the Russell Park men, duely celebrated, removing their balaclavas to shake hands with the Crokes players, after getting out of jail. Subs: Cormac Goodwin for B. McIntyre, Dave Crehan for C. Gavin, Eoin O' Brien (0-01) for P. Whitty, Conor Timoney for M. Kehir.